SCORPIONS fans worldwide can check out the exclusive worldwide premiere of the brand new live performance video for “Holiday” on USA Today.com. The never-before-seen (or heard) video was recorded during the beautifully orchestrated stripped-down concerts that became SCORPIONS’ forthcoming CD/DVD and Blu-Ray release, MTV UNPLUGGED, but does not appear on any configuration of the releases. Due out in North America on January 21st, material from MTV UNPLUGGED is taken from SCORPIONS’ first-ever “MTV Unplugged” show and features new acoustic versions of their best-loved classic hits, as well as five brand new songs. MTV UNPLUGGED will be available in North America as a deluxe CD + DVD package and as a Blu-Ray, and is being released in 50 countries, a testament to the German band’s iconic status worldwide. Recorded and filmed on September 11th and September 12th of last year, SCORPIONS‘ MTV UNPLUGGED was culled from two dynamic acoustic sets at the Lycabettus Theatre in Athens, Greece. The spectacular open-air theatre, situated 300 meters above the city, was an impressive backdrop for the first-ever open-air show in the history of “MTV Unplugged” (the theatre also shares a birth year with SCORPIONS themselves, having been built in 1965.). In other news, SCORPIONS are still in the midst of their epic Farewell World Tour; the tour has been going on for more than three years now. To the delight of their fans there is no end in sight, as to date the band has only played 23 out of the 38 countries planned on the itinerary. SCORPIONS are Klaus Meine (vocals/guitar), Rudolf Schenker (guitars/vocals), Matthias Jabs (guitars), Pawel Maciwoda (bass) and James Kottak (drums); additional musical support on MTV UNPLUGGED includes contributions from Swedish musicians and producers Mikael Nord Andersson (guitars, mandolin, lap steel, vocals) and Martin Hansen (guitars, harmonica, vocals). The duo is also responsible for the arrangements on MTV UNPLUGGED. 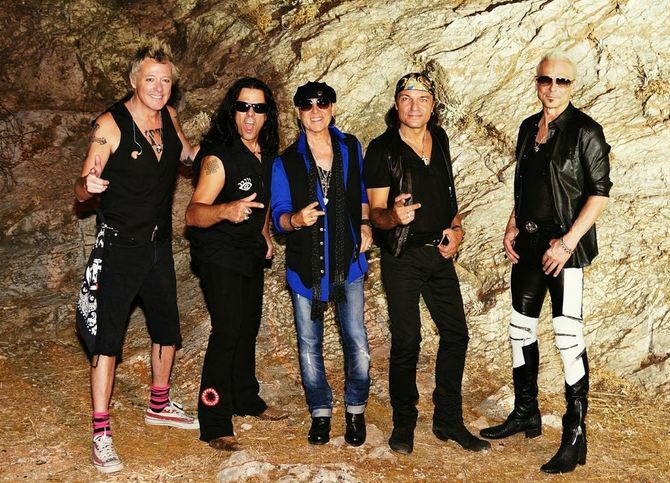 SCORPIONS are one of the most successful international hard rock bands of all time, selling upwards of 75 million records worldwide and playing more than 5,000 concerts in 80+ countries globally. Formed in Germany in 1965, the band has come to be known for their colossal radio and MTV hits “Rock You Like A Hurricane,” “No One Like You” and “Wind Of Change,” as well as their status as international rock ambassadors. VH1 ranked SCORPIONS as the #46 Artist on the “Greatest Artists Of Hard Rock” special, while “Rock You Like A Hurricane” came in at #18 on VH1’s “Greatest Hard Rock Songs”. The band recently received a star on the Hollywood Rock Walk in Los Angeles. To date, the Scorpions have released 18 studio albums and 5 live records. The track listing for legendary international hard rockers SCORPIONS’ new offering MTV Unplugged has just been revealed. Please see below for the complete list of songs on the CD and DVD. Due out in North America on January 21st, 2014, material from MTV Unplugged is taken from SCORPIONS’ first-ever “MTV Unplugged” show and features new acoustic versions of their best-loved classic hits, as well as five brand new songs. MTV Unplugged will be available in North America as a deluxe CD + DVD package and as a Blu-Ray. MTV Unplugged is being released in 50 countries, a testament to the German band’s iconic status worldwide. Click here to access the cover of MTV Unplugged. Recorded and filmed just a few months ago on September 11th and September 12th of this year, SCORPIONS’ MTV Unplugged was culled from two dynamic acoustic sets at the Lycabettus Theatre in Athens, Greece. The spectacular open-air theatre, situated 300 meters above the city, was an impressive backdrop for the first-ever open-air show in the history of “MTV Unplugged” (the theater also shares a birth year with SCORPIONS themselves, having been built in 1965, the same year the band formed). In other news, SCORPIONS are still in the midst of their epic Farewell World Tour; the tour has been going on for more than three years now. To the delight of their fans there is no end in sight, as to date the band has only played 23 out of the 38 countries planned on the itinerary. SCORPIONS are one of the most successful international hard rock bands of all time, selling upwards of 75 million records worldwide and playing more than 5,000 concerts in 80+ countries globally. Formed in Germany in 1965, the band has come to be known for their colossal radio and MTV hits “Rock You Like A Hurricane,” “No One Like You” and “Wind Of Change,” as well as their status as international rock ambassadors. VH1 ranked SCORPIONS as the #46 Artist on the “Greatest Artists Of Hard Rock” special, while “Rock You Like A Hurricane” came in at #18 on VH1’s “Greatest Hard Rock Songs”. The band recently received a star on the Hollywood Rock Walk in Los Angeles. To date, SCORPIONS have released 18 studio albums and 5 live records.